One of the strongest autoflowering varieties available, Trans Siberian is a crystal covered cross that looks like it has just come in from a blizzard. A mix of one of the world’s most popular strains, original White Russian (Serious) and our Auto #1, Trans Siberian has a long lasting and powerful almost sedative stone. It is a perfect blend being easy to grow, very fast finishing (65-75 days) but still yields just as well many other auto strains. Extensive covering of trichomes can be so heavy they may spread well down onto shade leaves, especially in the final 1-2 weeks of flowering. This can be maximised even further if it’s given its final flush just days prior to harvest and is then left for 48-72 hours in total darkness. Taste and smell is typically Indica, with a pungent skunky fuel aroma that White Russian is renowned for. 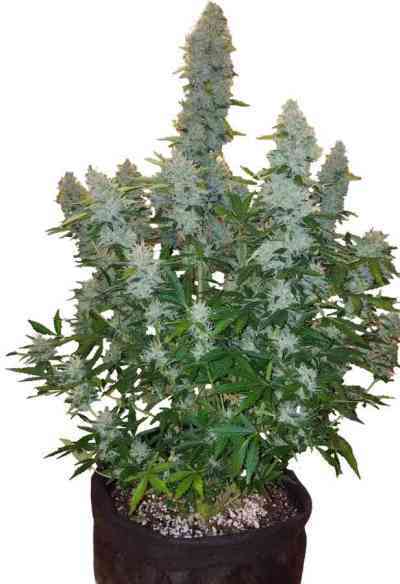 Trans Siberian delivers an outstanding high for an auto variety, both deep body buzz with a narcotic head stone. A true must for both connoisseur and beginner alike.